Less than a day after release to the web, several tools are available for XFN 1.1. Nvu 0.41 is already conformant to XFN 1.1. The latest version of the rubhub crawler (currently under development) supports XFN 1.1, and should be unleashed shortly, along with a new version of rubhub. Of course the XFN Creator has been updated to support XFN 1.1. Manuel Razzari has kept up with Creador de XFN 1.1, the Spanish-Argentinian version. And Serge K. Keller has just released Créateur XFN 1.1 and Creatore XFN 1.1, the French and Italian versions, respectively. Update: Jeroen Budts just updated XFN 1.1 Maker, his Dutch version. All of the XFN 1.1 Creators are made available through the very liberal Creative Commons 2.0 "by" attribution open source license. Want one in another language? Why not create one yourself and also offer it under the same Creative Commons license? Update: Jim Winstead has add XFN 1.1 support to blo.gs. Last week at the ACM Hypertext 2004 conference, Eric Meyer and I presented a poster on XFN - XHTML Friends Network, where we unveiled the XFN 1.1 profile for the first time. XFN 1.1 including the XFN 1.1 profile. I'm really pleased with the additions to XFN 1.1, namely, the terms contact , kin , and me . It's that last value that I think has the most potential. In short, with the new XFN rel="me" value, you can consolidate your various online identities: your home page, your blog, etc. so that they are all considered the same person from the perspective of XFN indexing services like Rubhub.com. 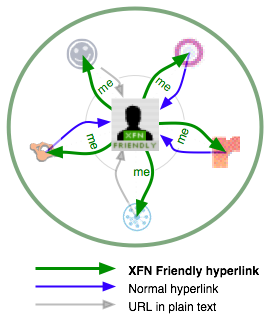 In addition to consolidating your various personal web sites, you can use rel="me" to also consolidate your various centralized social network service profiles, such as orkut, friendster etc. This is what I like to call the XFN sand dollar diagram (for obvious resemblances). Use XFN rel="me" to unify your home page or blog and all your social networking site profiles into a consolidated identity. In my opinion this is a very interesting innovation from GMPG: identity consolidation among centralized social networking sites which were otherwise disconnected islands in the social fabric of the Web. Read more on why identity consolidation is the key, even more so than import/export to/from or synchronization among such services. Hey Didier, you have a <link rel="Orkut"... to your Orkut profile in your blog — change that to <link rel="me"... for starters, in addition to of course changing your <head profile="..." to point to http://gmpg.org/xfn/11. Kelson, one thing you can do about the multiple-persons-on-one-blog issue is to only use XFN Friendly links within blog posts, because the context of the blog post sets a unique person (at least in your, and most common cases). This is excellent. Having Clay Shirky's thoughtful critique only a day after GMPG released XFN 1.1 is a sure sign that XFN has arrived. I'll follow up with a point-by-point response. For now, read these well-written responses to Clay's "analysis". © 1996-2004, Tantek Çelik, All Rights Reserved.